SRINAGAR, May 18 2013 (IPS) - Aadil Khan and his two siblings had been playing as usual behind their house in the village of Diver, 110 kilometres north of Kashmir’s capital, Srinagar, when they came across what they thought was a “plaything” laying on the ground. But no sooner had they picked the object up than it literally shattered their innocent lives into pieces. Stunned by the explosion from the shell, which the children had mistaken for a toy, they cannot remember much about the aftermath of that incident on Dec. 17. But the medics who treated them said they were “lucky” to have escaped with their lives. “Aadil and Mashoq received severe injuries while their sister Naza escaped any major damage,” Sharief Khan, the children’s father, told IPS. Khan, who supports a family of seven and earns his livelihood through manual labour, had to make a “tough decision” to ensure his children received proper medical treatment: he had to sell off a portion of his land. The value of land in his village is so low that he only received 800 dollars for the entire plot, which is less than two-eighths of an acre, but Khan had few options. “Who could have lent such a huge amount to a poor man like me?” he asked. Nearly six months later, Khan is still feeling the crunch of that sacrifice, forced to buy extra rice in the market because his remaining land does not yield enough grain to feed his large family. Already accustomed to the pangs of hunger, the Khan family now almost never has enough to eat. Such are the stories of the nearly 700 victims of shells and mines here in Kashmir, a valley tucked between the Great Himalayas and the Pir Panjal mountain range, whose scenic beauty conceals a bloody history that has its roots in the 1947 partition of India. As the latter celebrated its independence from British colonial rule, and the newly created state of Pakistan struggled to find its feet, Kashmir found itself claimed by both sides. While the two countries jostled for power over the resource-rich region, a United Nations resolution offered the valley’s residents three possibilities: either join Hindu-dominated India, Muslim-majority Pakistan, or vote for independence. But this last option was never made a reality, leaving Pakistan to seize a third of the territory and India to administer what was left. For decades Kashmiris have resisted this arrangement, enforced by India and Pakistan. The “pro-freedom” uprising of 1989 morphed into a resistance movement that continues to simmer today and has resulted in at least 60,000 deaths to date. Those whose lives have been spared have not been left untouched by the conflict, with hundreds maimed by landmines and unexploded shells months, even years, after they were planted. Most of the victims are children or farmers, who stumble across unexploded shells in fields where encounters between insurgents and the Indian army once took place. Though no exact figures are available, experts believe thousands of unexploded shells and mines are scattered around frontier areas like the northeastern administrative unit of Karnah; the western town of Poonch; the Rajouri district, also known as the Vale of Lakes; Uri, a town located on the banks of the river Jhelum; and in various remote villages. Earlier this year, four children were injured when a shell exploded in Chattabandy, a village in Kashmir’s Bandipora district. “A number of people, mostly kids, have either been killed or sustained injuries in such explosions in and around our village alone,” he said. For nine-year-old Aadil Khan, memories of the blast are too painful to recall. Though he is now recovering, he is plagued by the hardships his family has endured as a result of his injury. But activists lament that the Khan family’s situation is not unique. Those maimed by stray explosives receive standard government compensation of about 1,500 dollars, a sum that does not even cover the most basic treatment and fails to take into account the fact that most victims end up disabled for life, according to Dr. Hameeda Nayeem, a civil rights activist and professor at Kashmir University. She told IPS nearly 100 percent of the victims come from poor socio-economic backgrounds and belong to families who earn less than 95 dollars a month. Qalandar Khan, a farm worker who was handicapped by a shell in 2012, is one such example. In the last year his family has spent 1,900 dollars on his treatment by selling off their cattle. The medical expenses have devoured their savings, and the loss of their animals has left them with almost no income since Qalandar was the family’s sole breadwinner. Clinics providing free services are few and far between. One of them, the Hope Disability Centre, is currently treating 150 of the roughly 700 landmine victims, according to Director Sami Wani. Working in collaboration with the Paris-based Handicap International, the NGO sends its coordinators into affected areas to identify families or victims in need of support, and even “provides prosthetics free of charge,” Wani told IPS. Zahid Ahmad, coordinator of the northwestern Kupwara district for the Hope Disability Centre, says he found Qadir Sheikh in the village of Dardsun during one of his routine searches for victims. Rights activists say that the government should offer better compensation to those who have lost body parts and been rendered disabled. Caregivers of victims who are bedridden, immobile, or otherwise unable to perform the most basic life functions are under enourmous pressure. 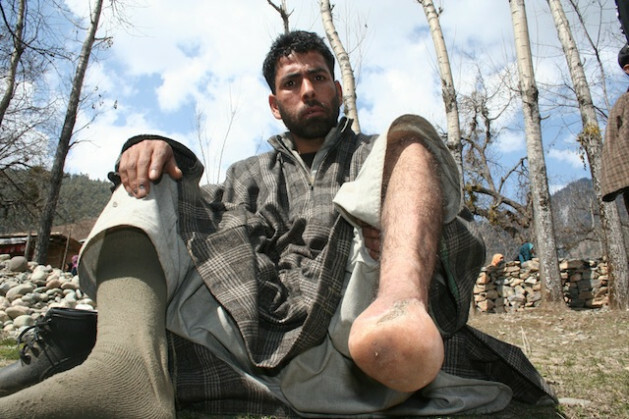 In the village of Marhama, Habeed Lone sits by the side of his disabled wife Fata, who had both legs amputated after stepping on a mine on her way home from the family farm. “We have six children and I have to take care of them and my wife single-handedly,” Lone tells IPS. According to experts like Parvez, “It is the duty of security agencies to sanitise the surroundings of a place where they carry out combat operations,” adding that no effort has so far been made to raise awareness among the general public about the hazards involved in coming across these destructive shells.